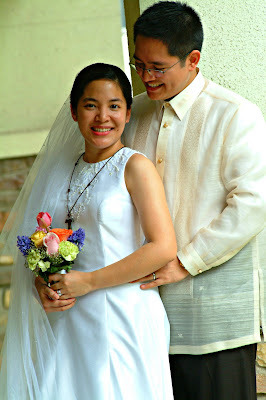 January 7, 2013 marks our 7th wedding anniversary — thank You, Lord, for my wonderful hubby! And thank You, Lord, for these seven blessed years! Happy 7th, Honey! With this in mind, I decided to share with you, dear readers, how God worked through our wedding preparations. I must say that the time of our engagement was really exciting! But it was also challenging. If you read my post on my husband’s proposal, then you know that he had already relocated to the province. This meant that we would only be together on weekends when he would go back to the city, and most of the preparations had to be done while we were apart. We decided on a January wedding. That gave us about six months to prepare. We prayed every step of the way. We prayed that God would lead us to the Church suited for us, as well as the venue. We asked for wisdom regarding who our priest ought to be, as well as our entourage. We prayed about the liturgy, as well as how to go about the reception. We prayed that God would lead us to the right suppliers. We prayed for guidance regarding our honeymoon. We prayed for provisions. God answered prayer upon prayer, and even did miracles! One of the things I clearly recall was how it worked out that we were the last couple to be accepted in some required pre-marriage seminar — another couple didn’t show up, so we were accommodated. Otherwise, the next schedule was on the following day; thing was, my fiancé could only be in the city on that day, and he would have gone back to the province by that time. God worked out our schedules! Another thing God worked out was how he provided a priest for our wedding. We already invited one of our priest-friends to officiate, and he gladly agreed. But one day, just weeks before our wedding, he called me up saying he could not officiate the wedding. He apologized profusely, but did not tell me the reason. But God led us to another priest-friend, who was gracious enough to say yes on such short notice. Another miracle! Still another answered prayer was regarding our honeymoon. I prayed for a message from the Bible, asking God to somehow show us where we ought to go. When I randomly opened my Bible, the passages had the words palm, springs and desert. And guess what? A generous soul offered us superb accommodations in a place called Palm Springs, California (a desert, actually!) — her wedding present to us! Another would pay for our airfare, and other generous souls also provided for the pocket money! Here was the clincher: a week before our wedding, we still couldn’t get a booking for our trip. During our Tuesday prayer meeting before our wedding on Saturday, I prayed so hard for God to give us a booking. While I was kneeling, I sensed that God was telling me it was done. True enough, the following day, our travel-agent friend called and finally confirmed that she was able to book us, and our flight would be that coming Monday! We decided at the very beginning that we wanted the Lord to be the center, not just of our wedding preps and the wedding proper, but of our marriage. And at the very beginning, He already began to surprise us with His favor — not because we deserved it, but because He is such a loving and generous Father!